BLOOMINGTON, Ind. -- Students at Indiana University will build basement printing presses and print their own underground newspaper, learning from a legendary Polish journalist whose low-tech publishing innovations fueled the popular uprising that brought an end to Communist rule in Poland. Witold Luczywo will be in Bloomington this month to team-teach the one-of-a-kind course with IU history professor Padraic Kenney. It marks the 30th anniversary of the founding of Solidarity, the Polish trade union that grew into the largest social movement in history, with 10 million members. 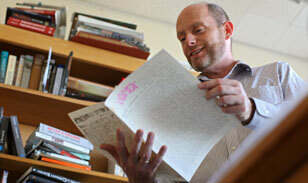 IU professor Padraic Kenney peruses an underground newspaper produced in Poland. The course, titled The Technology of Revolution, meets on Saturdays through October. Students will build presses on Oct. 9 in the basement of a house near campus. They will print the newspaper Oct. 16 at the same location. "One of the most remarkable things about Solidarity was that it was so innovative," said Kenney, who directs Indiana University's Polish Studies Center. "Communication was a basic problem for them -- the members had no access to the official media. 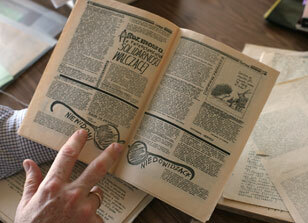 They essentially had to do everything on their own, and their newspapers were crucial." Until the late 1970s, the Polish opposition could only reproduce printed materials with typewriters and carbon paper. But in 1978, Luczywo developed a sort of primitive silkscreen printing method that allowed presses to be assembled from household materials. For ink, the printers used shoe polish. Suddenly an activist could turn out thousands of copies of articles critical of the government. As Solidarity grew in size and influence, underground newspapers flourished. In the 1980s, there were more than 2,000, produced and sold in factories, universities and high schools, despite periodic government crackdowns and the imposition of martial law. "They were printed and distributed in secret," Kenney said. "The editors might make themselves known, but the printers couldn't. Their equipment could be seized, and they could be jailed." That in fact happened to Luczywo, an original member of Solidarity who founded and published several underground newspapers in the 1970s and '80s. He was arrested and jailed overnight more than two dozen times, and his house was searched repeatedly by secret police. The IU students won't face that risk, but they will work against some of the same physical restrictions as the Polish underground publishers, writing their stories on typewriters wrapped in towels to muffle the noise and cleaning their press screens in an upstairs shower between press runs. The students also will be studying the recent history of political uprisings, especially the ideas behind democratic revolutions that swept across the world at the end of the Cold War. Their underground newspaper will feature articles that apply those concepts to contemporary social movements in the U.S., the Middle East, Latin America, Russia and elsewhere. In keeping with the spirit of the Polish underground press, Kenney said, students will distribute newspaper copies clandestinely, in ways that won't be announced in advance. "It will be a surprise," he said. Also marking the 30th anniversary of the founding of Solidarity is a special exhibition at the IU Wells Library, titled "The Communist Information Monopoly in Poland, and How the Polish Opposition Broke It Up." The exhibition celebrates Indiana University's acquisition of more than 1,000 unique booklets, brochures and monographs formerly owned by the Central Trade Union Council of Poland, including most of the national periodicals published by the Polish trade union movement prior to 1980. It is open until Oct. 29 in the Reference Reading Room of the library. News media are invited to attend the class on Oct. 9 and Oct. 16. To make arrangements, contact Padraic Kenney at 812-855-1923 or pjkenney@indiana.edu; or Steve Hinnefeld at University Communications, 812-856-3488 or slhinnef@indiana.edu.